Make less engaged visitors sign up to your newsletter & convert them into sales later. Detect if someone is about to leave without buying and prevent cart abandonment. Boost your avg. order value & generate larger purchases for the same amount of traffic. Turn new visitors into first-time buyers and existing customers into repeat buyers. Value your customers by asking feedback & improve your customer satisfaction rate. Build and grow social communities, and reach your prospects through social media. Every online store that is focused on profit is also focused on getting more conversions out of their website visitors: encouraging them to buy or – at least – subscribe. The common characteristic of these campaigns – and the secret to their success – is that they were sure to use their popups without ruining the user experience of their site. They wanted to make their popups truly useful for their visitors with relevant content and did not want their popups to be seen as annoying “obstacles”. In this article we’ll look at 5 ways you can use onsite retargeting without ruining the user experience on your site. Let’s see how you can build a successful onsite retargeting campaign with popups that are really user-friendly! There are few things that are more annoying on the web than traditional entry popups. These are popups that appear immediately when you open a website and contain frustrating advertisements. Overall, they are always more annoying than helpful, and will really degrade the user experience on your site. The overuse of traditional entry popups containing unwanted, irrelevant advertisements is why Google has created webmaster guidelines to avoid the use of these popups, and using them can impact your search results. The popups are prohibited because they open in a new window and disrupt or block your visitors’ activity. So, entry popups should be avoided. Unlike typical entry popups, which are annoying and can actually hurt your conversions, OptiMonk popups appear in the same window of your visitor’s web browser. They don’t prevent visitors from accessing the navigation bar and they’re absolutely Google-friendly. Instead of bothering your visitors with entry popups, let your visitors get to know your website first and show your popup when their behavior shows they are ready for a secondary message. Display the popup after ‘X’ second(s) when someone is reading your actual page to catch the attention of inactive visitors – inactivity may show that these visitors are stuck, and require further information or engagement to continue shopping. Show the popup after a visitor has scrolled down on your page at least ‘X’ percent to catch the attention of actively reading visitors – scrolling down, on a blog for example, can mean that a visitor has finished reading your article and they’re ready for some new content. Recover your abandoning visitors by displaying your popup on exit-intent. This catches the attention of visitors who are leaving your site without converting. However, it’s vital that you take into account how many times a popup can appear per visitor. Pay special attention to the maximum number of times when the popup can appear, typically you want to limit this to 2 times or only once per visitor. You can also specify the time period between two appearances. Here’s a good example of how to use popups based on user engagement. Zooji.com, the shoe retailer, displays its exit-intent popup based on engagement: this “$8 off” discount can be only seen by visitors who are abandoning their carts. Your popup will only be useful and potentially “loveable” for your visitors if it provides a solution to their problem. Of course, it’s impossible to learn each individual visitor’s problem without contacting them personally – however, by segmenting your visitors, you can determine some groups of visitors that contain people with similar needs and characteristics. These segments vary by industry and product line. However, all businesses can segment their visitors intro groups based on their interests, and even their stage of the buying process. To work out your visitor segments, try to think like your customers (Who are they? What do they want? When do they want that? Are they ready to buy?) and think over your “customer journey” (What are the steps of customer acquisition? Do your visitors need some additional information or extra persuasion before buying?). 1. New vs returning visitors: Returning visitors or customers (or logged in visitors) are usually more engaged people who are closer to buying than new visitors who are learning about your website for the first time. 2. Cold vs hot prospects: Instead of handling all your visitors like they are “hot prospects” who are ready to buy right away, you should create different conversion goals for hot and “cold prospects” those who need further engagement before making a purchase decision. For hot prospects the conversion goal is simple: you should encourage them to make an immediate purchase. You need to show these prospects content directed towards a sale, for example a discount or deal. But for cold prospects you need a secondary conversion goal, typically to make them subscribe. After getting their contact details, you will be able to communicate with them over time and nurture your relationship with them until they are ready to buy. 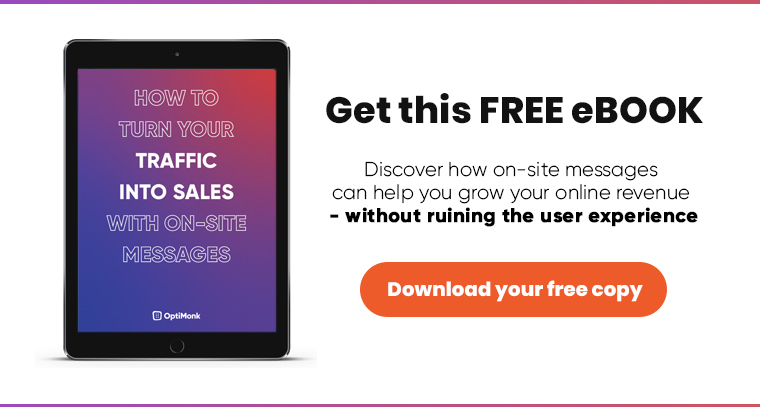 For this reason, you need to show cold visitors content that makes them subscribe, for example a downloadable eBook in exchange for signing up. Let’s take a look to see how it works in action. Here’s a great example from BOOM!’s campaign that engages visitors with specific messages relevant to them depending on their place in the buying process. In addition, they use another exit-intent campaign to offer an instant 10% off coupon to their hottest visitors – people who have expressed the most interest in BOOM!’s content or are about to abandon their cart. 3. Geotargeting: If you sell internationally, location-based targeting or geotargeting can be a great way to boost conversions. With geotargeting you can create as many different messages for as many target countries as you’d like. 4. Target visitors based on their stage in the buying process: In a typical buying process or “sales funnel“, your first goal is to get visitors into the funnel — this is known an Awareness. You also need to guide them through the subsequent of the buying process – Interest, Consideration, Intent and Evaluation – before arriving at their final destination, Purchase. It isn’t practical to communicate the same message to early-stage visitors and to visitors who are in more advanced stages of the buying process, or those who have at least considered buying a solution for their needs. 1. For early-stage visitors, your primary goal is increasing their engagement and awareness of your offer. You can also use them to grow your retargeting lists by labeling and adding them to your “cold traffic” list. You can increase engagement and awareness for early-stage visitors by using relevant and useful blog posts, social media updates, infographics, audio and video podcasts, digital and print magazines, and more. 2. Middle-stage customers are more engaged visitors who are now familiar with your business. For these visitors, your most important goal is lead generation, or list building. These visitors are part of your “warm traffic” so it’s also important to add them to a different remarketing list from the early-stage visitors. For these middle-stage customers, it’s better to use educational and useful resources, webinars, events, discounts or coupons, or even quizzes and surveys to be able to communicate the most relevant messages at this stage in the buying process. These resources and content can be where you make your customer acquisition. 3. Your most valuable visitors are late-stage visitors. These are your most engaged prospects. In their case, lead nurturing is one of your most important goals. In addition, you also need to keep working hard to maximize perceived value, and driving towards a sale. Growing your retargeting list is important at this stage as well – for example, you can create a specific list for visitors who abandon their cart. You can engage late-stage customers by providing discounts, offers, and package deals. You can also offer demo products and free trials, presenting customer success stories, presenting different comparisons and holding webinars and events. This allows you to display different popups to visitors coming from Facebook and AdWords ads, show another campaign to prospects who have visited a special landing page but didn’t buy anything, or even target visitors who have already added some items to their cart. It’s as easy as that. You may have heard the phrase: “If you’re selling to everyone, you’re selling to no one”. This is especially true with popups on your website. Your visitors are different: they have different interests and concerns, and they’re looking for different products to achieve different goals. Why treat them all the same…? Once you’ve separated your visitors into groups based on their interests, demographic or geographic variables, and even their stage in the buying process, you can show them the most appropriate message. For instance, if you sell electronics and a visitor is interested in smartphones, “25% OFF Smartphones” is much more effective than “25% OFF Selected Products”. Everyone gets the same message – in other words, you broadcast a general offer towards all of your website visitors. This is not recommended. There is an offer for hot prospects and cold prospects – that is, you divide your audience into two major segments based on their engagement. Even this simple segmentation can make a difference. There are several offers for each of the main visitor groups – in this case, you divide your visitors into several different groups based on relevant variables and reengage them with customized messages for each group. Everyone gets a customized message using Dynamic Text Replacement – this is the highest level of relevancy which makes 1:1 customization possible, ensuring a completely tailored user experience. With Dynamic Text Replacement, the text in your popups will update automatically based on the variables you choose. Dynamically altering text allows you to gather leads more effectively, because it enables you to display highly targeted messages to different visitor groups – using only one popup. You can create one template and then alter the content to meet the needs of your audience. Using this approach reduces the amount of effort and ensures each of your visitor segments will see the most relevant content. Looking at our example from above, the electronics store promotes “25% OFF Smartphones” when a visitor tries to leave their site from a smartphone category page or product page. However, when a visitor is browsing for laptop accessories and tries to leave the site, the word “smartphone” changes automatically to “laptop accessories” on the popup – speaking directly to the customer’s needs. A value proposition is how you convince your customers that they will benefit from your product. To maximize your conversions with onsite retargeting you should limit yourself to one value proposition or goal per popup and be sure to highlight it. If you are trying to achieve multiple goals with your popups, you’ll decrease the chances of completing any of them. Convincing your visitors to take different actions at the same time will delay decision-making and leave people feeling confused. Ultimately, it will be hard to understand your message and the value of your offer, and it will deter visitors from signing up or making a purchase. It’s also important to clearly display your message in your popup and not use any distracting graphics that make it hard to read the text. In the examples below, the popup on the right with no background makes the “$10 Off” discount the main focus of the popup. You can learn more about how to achieve these goals using onsite retargeting in this FREE eBook. The success of using onsite retargeting lies in providing value to your prospects. When you ask your visitors to sign up for your newsletter, you should give them a special reward in exchange for subscribing, for example: discounts, a free eBook, email-only-deals, free gifts, VIP membership registration, etc. However, it doesn’t matter how valuable your giveaway is, if you ask for too much information, no one will sign up. New visitors may be hesitant to provide their information and they may be too busy to provide detailed information about themselves. On the other hand, you need to know as much information as possible about every prospect if you want to deliver personalized messages. So, you need to compromise by keeping the following rule in mind: “less is more”. The less data you request, the more conversions you will have. By keeping your forms simple, you’ll get more people to sign up. In many cases, an email address is enough, such as the example below. To be able to personalize your messages in the future, requesting only the first name and email address is another popular “less is more” approach, as shown in this example from Hulala. Overall, any form elements should be easily understandable. You can lose leads by having a form which is difficult to read or navigate. By following these essential guidelines, you can use popups on your site without ruining the user experience. First of all, never use an entry popup, instead create popups based on engagement on your site. Defining visitor segments and then displaying relevant offers is the next step. You can take this to the highest level of customization using Dynamic Text Replacement and automatically update the content of your popups for each visitor group. Whatever segments you are targeting, avoid a “one-size-fits-all” and stay focused on only one value proposition at a time which is clearly displayed. Using a “less is more” approach with your popups and specifically your forms will also help increase conversions. You can increase the conversions on your site and improve sales and signups without hurting the user experience. And, by following these rules, and displaying relevant content or redirecting visitors to your best deals, you can actually improve the user experience on your site! Which guidelines do you think are the most important for the popups on your site? © Copyright 2014 – 2019. OptiMonk. All rights reserved!